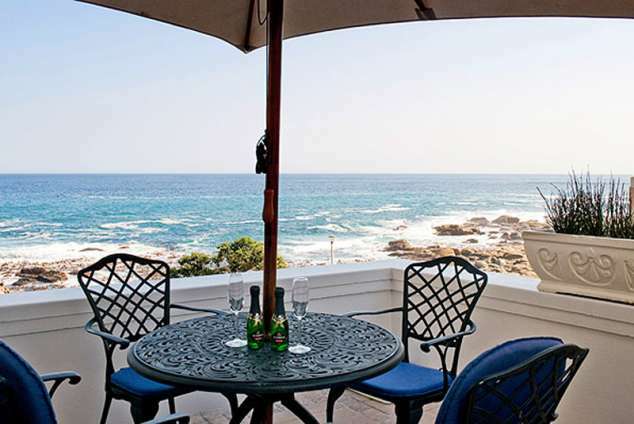 Bantry Beach Luxury Suites - Bantry Bay Accommodation. Located opposite Saunders Rocks beach in the heart of wind-free Bantry Bay, an up-market and exclusive area enjoying picture perfect sunsets, the lapping ocean at your doorstep, and dramatic sea and mountain views. Bantry Beach Luxury Suites are modern and sophisticated, with an African - Colonial ambience. Situated between Camps Bay, Table Mountain and the Cape Town City Centre. Just a two minute stroll to the trendy Bantry Bay Deli, and the Ambassador's cocktail bar. People in the know and well-heeled travellers prefer Bantry Bay's amazingly sheltered alcove to anywhere else in the Cape, where they experience the most idyllic sea-side location with its perfect climatic summer conditions ensuring a fantastic holiday experience. Bantry Beach rates include a housekeeping service (Mon - Sat), all 100% cotton percale bed linen and towels. A full bar fridge is available as an additional service. Master bedroom with queen size bed, en-suite (shower). Satellite TV, mini Hi-Fi. Air-con / heaters. Sea view lounge and with equipped kitchenette. Private patio overlooking the beachfront. Electronic safe. Prepaid telephone. Intercom access. Wifi internet. Remote security. Bar fridge. Double bedroom with queen size bed & aircon/heating, en-suite (extra large shower). Double bedroom with two single beds & fan/heating, en-suite (bath/shower). Open plan lounge with equipped cherrywood & granite kitchen. Satellite TV, DVD. Private garden patio. Electronic Safe. Pre paid telephone. Wifi internet Remote security. Bar fridge. Master bedroom with queen size bed, marble bathroom en-suite (bath, separate shower, bidet) opening onto front balcony. Double bedroom with double bed opening onto mountain view patio. Double bedroom with two single beds opening onto mountain view patio. Air-con / heaters in main bedroom, fans / heaters in other bedrooms. Marble guest bathroom. Open-plan maple and granite kitchen with modern appliances. Lounge dining area opening onto large front entertainment balcony with beach and sea views. Satellite TV in lounge and main bedroom, DVD. Electronic safe. Prepaid telephone. Intercom access. Remote Security. Wifi Internet. Bar Fridge. Master bedroom with queen size bed opening onto front balcony with corner bay views, travertine marble bathroom en-suite (bath, separate shower, bidet). Aircons & heating in all bedrooms. Double bedroom with queen size bed opening onto mountain view balcony. Double bedroom with two single beds opening onto mountain view balcony. Marble guest bathroom. Open plan maple and granite kitchen with modern appliances. Double volume lounge/dining area opening onto front balcony with beach and sea views. Top level sundeck with large swimming pool and sea, beach and mountain views. Satellite TV (3), DVD, home theatre. Electronic Safe. Pre-paid Telephone. Intercom Access. Wifi Internet. Bar Fridges. Remote security. 77458 page views since 22 Oct, 2002.